Welcome to this Waring Blender vs Vitamix guide. Whether you're shopping for your home or commercial business, this guide can help. Whether a Vitamix or Waring Professional is better for your home. Which one I'd recommend for a business. Side by side comparison of the Waring Pro and Vitamix home and commercial models. What Do Others Say About the Waring Xtreme? What Do Others Say About Vitamix Blenders? If you're going to be using the blender in your home, I'd highly recommend the Vitamix 5200 (or any counter-top Vitamix) over the Waring Xtreme or any other Waring including the Waring Blade. Two reasons: Warranty and Tamper. The Waring Xtreme only has a 3 year warranty because it's built for commerical use. The 5200 comes with a 7-year warranty for home use. The tamper (which helps push the ingredients to the blades) is only found on the Vitamix. A very important accessory if you're doing super thick blends. The reason is because it tends to run a bit cheaper than a commercial Vita-Prep and also has a bit longer of a warranty. It’s also got a more powerful motor. However, if you plan on doing blends that are super thick — I recommend going with a cheaper commercial Vitamix with a tamper — like the Vita-Prep. In my experience, having a tamper to press ingredients into the blades is a time saver — even if the blender is less powerful. When doing thick blends with little to no added liquid, ingredients usually tend to get stuck to the sides of the jar before creating a vortex. Without a tamper, you have to stop blending to readjust — then blend again. Limited 3 Motor Warranty and 2 Year Parts & Labor Warranty. 3 Year component warranty with one year on labor. 1 Year on other blade assembly, container, etc. 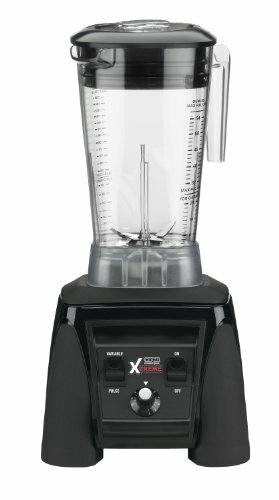 Variable Speed Dial: Perhaps one of the most important (yet overlooked) feature on a blender is variable speed control. This Waring model has it via a small knob located directly on the interface. It's an important feature because starting slow and moving up to fast allows ingredients to catch more easily and form a vortex. Starting too quickly will push everything away from the blades right away. It's also useful for getting a rough chop on ingredients rather than a puree. Pulse: Pulsing is important because it allows you to rotate the blades quickly without a full blend cycle. Much like the variable speeds, it's useful for when you just want to do a rough chop for tasks like blending salsa. Powerful Motor: A powerful motor isn't everything, but it sure helps when you want to liquefy ingredients quickly. This Waring blender has 3.5 HP -- more than any home-use Vitamix and even more than the most popular Blendtec models (like the Total Blender). It doesn't have a tampering device, but it's strong enough that you won't need it for the majority of applications. As I've mentioned, making blends with no liquids is difficult without a tamper. This video demonstrates what I'm talking about. In the user video below, you'll see that the blender works a lot better when you have liquid. It forms a powerful vortex and makes all the contents smooth. Venting Lid: If you're blending anything hot or you want to add ingredients in while blending, the Waring has a removable cap on the lid. This is extremely important for multi-layered sauces or soups. A venting lid is the only way to reduce pressure build up which can cause major problems (like blending explosions). Tamper: A tamper is used to push ingredients into the blades. It's one of the things that Vitamix is known for. Personally, a tamper is a must-have for me on a blender. Without one it's nearly impossible to liquefy ingredients without any liquid. A good example is blending banana ice cream. Even though this video is from Vitamix themselves, it's a great example of how well the tamer works and why it's important. Whenever I've tried to make banana ice cream without any liquid and without a tamper I always have to stop blending and adjust the ingredients. This happens all the time with my brother's Blendtec, which has similar horsepower to the Waring Professional. Venting Lid: Vitamix made a name for themselves by being the blender that can make hot soup just by the friction of the blades. This requires them to have a venting lid to reduce pressure build up - just like the Waring. Be sure to read the instruction manual first - because Waring has pretty specific instructions for this. Variable Speeds: All Vitamix blenders come with variable speed control - either via a knob or slider on the control panel. It serves the same function is in the Waring -- allowing ingredients to catch before turning the speed all the way up. Warranty: Vitamix blenders have excellent warranties -- especially the home use ones. Any Vitamix for your home is going to come with a minimum 7-year warranty if it's new and a 5-year warranty if it's refurbished. Newer models like the Ascent line, even come with a 10-year warranty! The Vitamix Commercial Warranties are a bit different – they’re generally 3 years on components and one year on labor. The containers and blade assemblies are covered for one year. 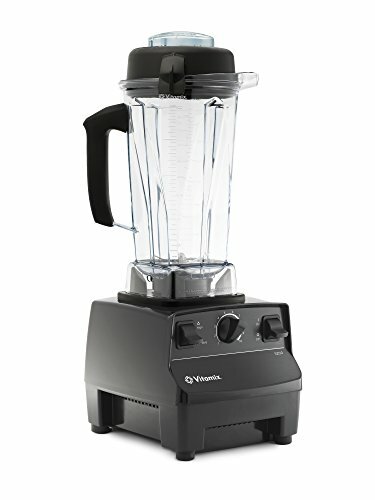 See full details https://www.vitamix.com/us/en_us/Commercial/Performance/Warranty?referer_st=commercial+warranty&sc=site” target=”_blank” rel=”noopener”>here. Commercial Vitamix units (like http://blog.burkett.com/2012/07/16/what-kind-of-blender-does-starbucks-use/” target=”_blank” rel=”noopener”>The Quiet One that Starbucks uses are set up a bit differently than the household units. Not all have tampers and many have noise-reduction functions. Some are designed specifically for certain things like frappes and cocktails and aren’t designed for making things like hot soups like the home units are. The Vita-Prep. is the most similar to the home units in terms of function and price range, which is why I used it for this guide. From my investigation of all the user reports out there, people seem to be very happy with the Waring Xtreme. In fact, several people noted that the power difference is noticably higher compared to a Vitamix. This makes sense given that it has 3.5 HP. Because of the lack of tamper, some people comment about having to move the contents of the pitcher around when doing blends that are really thick and icy. I was able to find some niche complaints about black specks --but Vitamix also had an issue with this at one point back around 2015. As of writing this, both brands seem to have corrected the issue. Some users also complained about the warranty - saying that Waring would make them ship the blender at their own expense. Having personal dealt with the Vitamix warranty center (after 5+ years of use) -- they've always covered shipping both ways for repairs. Overall, the word on the street about the Waring Xtreme is that it's really powerful, but could use a tamper in some circumstances and an improved warranty. While my personal experience with Vitamix has been nothing but positive, I wanted to take a look at what others were saying to make it fair. Overall, Vitamix has an extremely positive brand reputation. Their warranties are great and their blenders just work. From what I've seen, it seems like almost 90% of people are happy with their blenders. But there have been some people who were less than satisfied. Some users are underwhelmed at the power and were expecting more from the brand's reputation. And while it's true that Vitamix blenders are mostly 2.2HP or less, the tamper and overall design makes it more than capable of any blending job. There are a few complaints here and there about units malfunctioning. But this seems to happen with the reconditioned units. I would still consider a reconditioned unit for the cost savings, though. Vitamix has a pretty rigorous reconditioning process and they still come with a 5-year minimum warranty. Finally -- as noted on our Vitamix vs Nutribullet Guide-- many people also were unsatisfied with the Vitamix's S-Series - their line of personal blenders. Many people thought they were too costly compared to the amount of power and function they brought to the table. 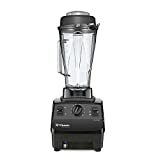 And I would agree - I'd much rather get a smaller counter top Vitamix blender like the E310. As you may have gleaned from this article – I would strongly recommend a Vitamix blender such as the 5200 over any Waring unit, if you’re using it in your home. I would do this because of the long warranty and tamper. But if you’re getting this for something commercial – the Waring Xtreme Professional is worth considering if you’re on a budget and don’t think you’ll need a tamper. It’s got enough power to liquefy ingredients very quickly, is usually pretty cheap and has a long warranty. If you’re doing blends with very little liquid and think you’ll need a tamper – consider the Vita-Prep commercial Vitamix.